The metropolis and mental health: are big cities making us sick? It is often said that we are living through another period of mass urbanisation – an age in which more and more people, in all regions of the world, are moving from rural towns and villages and trying to make their lives in cities – often megacities with upwards of 25m inhabitants. Indeed, the United Nations now predicts that by 2050 two-thirds of the global population will live in cities. Policymakers have tended to concentrate on the economic and environmental consequences of this development. But there has been less attention to the effects that such a movement might have on mental health. Given that many experience urban stresses and strains – the hubbub, the noise, the competition, the density, the unnatural and frenzied atmosphere, the enforced proximity to strangers, the frequent combination of crowds and isolation – should we not be paying closer attention to the mental, and sometimes pathological, experience of city living itself? This question of the “metropolis and mental life” occupied many who tried to make sense of the last great period of urbanisation – that enormous rural-to-urban migration that took place in industrialising Europe and North America during the 19th century. The German sociologist Georg Simmel was one of the first to describe what he called the “blasé” attitude of the city-dweller – a kind of psychological indifference that was necessary if a person’s nerves were to cope with the endless nose and stimulation of city life. At the same time, the developing science of epidemiology found disproportionately large amounts of mental illness among those now dwelling in the city – from the alcoholic delirium of the uprooted rural immigrant to the mental breakdown that is often called schizophrenia. Map of the percentage of patients with schizophrenia, bipolar affective disorder and other psychoses. Areas in dark blue are below average, yellow areas are similar to national average. Light blue areas are above average. Psychiatrists have long tried to make sense of such patterns. Is it that those most prone to mental collapse “drift” to certain parts of the inner city where they feel at home? Or does something in the stress of city life itself cause these breakdowns in persons who would be perfectly adapted to country or village life? If the latter, then we need to explore what it is about life in the city: density of housing, deprivation, poverty and unemployment and the dynamics of race and racism that get intensified in urban space, and so on. But, on the other hand, maybe all of these act as precipitating factors, which affect those who are vulnerable because of a biological predisposition. Or maybe it’s both: are the roots of this urban mental disorder in the individual, in the city, or in the relation between? Despite detailed demographic, epidemiological and sociological work, this question remains unresolved: no consensus has been formed about the relations between mental life and the metropolis. Given the rise of megacities, and the challenges of planning mental health services, that question is even more urgent than it was in the 19th and 20th centuries. In a new paper, written for the Economic and Social Research Council’s (ESRC) Urban Transformations portfolio, and arising out of a series of interdisciplinary workshops funded by the ESRC we argue that answering this question requires us to bridge the gulf between the social sciences and the biological sciences. 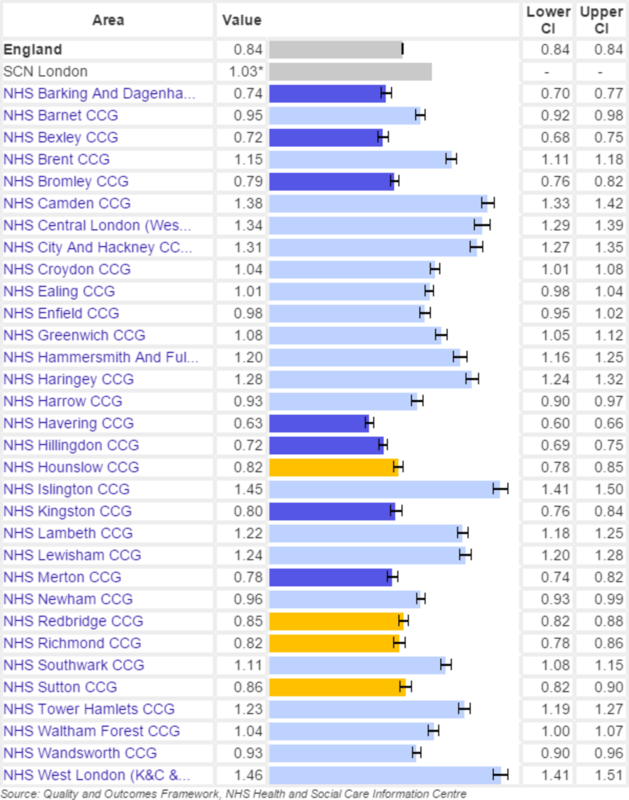 Incidence of mental health reporting in London. Areas in dark blue are below average reporting, yellow areas are similar to national average. Light blue areas are above average. Recent developments in the biological sciences have shifted our understanding of organisms and their relations with their physical and social milieu. Organisms, including human organisms, can no longer adequately be understood as enclosed systems bounded by membranes of cell, organ and skin. The findings of research in biology – from genetics to neuroscience – require us to conceive of human beings as open and permeable, developing and transforming over time, in ongoing dynamic interactions at the level of molecules, genes, cells and brains with their physical and their social environments. Of course, many of the problems of city living are rooted in social and economic relations, but those relations are also matters of bodies and brains. Similarly, while mental disorders are undoubtedly manifested in neurobiological processes, we need to move beyond a focus on isolated individual brains in addressing them, begin to understand – and research – the city as a “neurosocial” space and to look at how urban life penetrates deep into the mental and neural life of city dwellers. New research, new methods and new data offer some promising pathways for novel theories and concepts to understand how urban existence gets under the skin. For example, we could combine approaches from biological and social sciences to understand how the precarious social lives of rural migrants in contemporary Shanghai are implicated in the development of psychiatric disorders in that rapidly expanding urban environment. It might mean combining decades of detailed epidemiological data from the streets and housing estates of south-east London with current research on the neuroscience of stress – and with anthropological work that zooms in on the micro-interactions of street-life. The task for researchers is challenging. Are the same processes at work in cities as different as Shanghai and London? Will the number of variables and factors in these neurosocial pathways be so large as to defy our attempts to frame them into a coherent theory? Nonetheless, if we are going to get to grips with the consequences of urbanisation for mental health today, we need to start thinking very differently about city living – not simply as a form of social organisation that has biological consequences, but as a form of life whose neurological and sociological aspects are quite inseparable from one another. A version of this article also appears on Urban Transformations.